To date, three of my kids have learned, or are in the midst of learning, Algebra. One used a text book and did algebra at home, all three have done some online algebra classes, and now two are taking it in high school. The different methods used to teach Algebra have all been successful and I have no complaints, but I'm willing to try new-to-us ideas and fresh programs, especially when it comes to something that's kind-of-not-very-fun-at-all like Algebra, in an effort to make the learning as smooth as possible. Adam, at age 12, began a Pre-Algebra course this year, using curriculum from the same text book company we've always used for math, the same book his older siblings used. The program is fine, very good, but it's not perfect and some of the kids have struggled at various times. 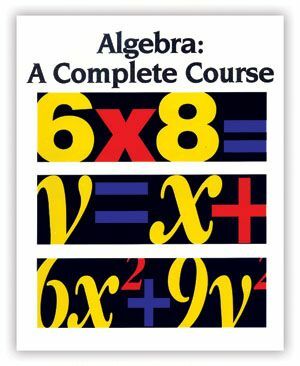 This fall we were given the opportunity to review VideoText Interactive's Algebra program Algebra: A Complete Course, which combines Pre-Algebra, Algebra 1, and Algebra 2 into one course to be completed over a 1-3 year time period. Their tagline, intriguingly, is "It doesn't have to be that hard!". VideoText Interactive sent us complete Module A and Module B, the first two modules of their six-module course. Each module contains 3 DVD's with all lessons for the module and five softcover 8.5" by 11" books; Student WorkText which contains lessons and exercises, Course Notes with summaries of the video lessons, Progress Tests, Solutions Manual with detailed step-by-step answers to the exercises in the Student WorkText, and Instructor's Guide with Detailed Solutions for Progress Tests. Initially Adam and I were a bit overwhelmed. There were a lot of books and a lot of DVD's, and we were used to just one book and one answer key. Included with our materials was a purple sheet of paper that really guided us through getting started. On that sheet was the number for the help desk, with clear instructions to call at the first sign of trouble or confusion - we've gotten through the lessons so far without needing to call, but if we ever do need to we certainly will. The purple sheet also states, boldly, to view the training session and not to skip Module A, as it is not a review. On the reverse side of the purple sheet is information about downloadable progress checklists on the VideoText Interactive website (under "Support and Resources". While I think a progress checklist would have been very beneficial I instead incorporated his lessons into our regular weekly lesson schedule, adding the tests in when necessary. Adam and I began by viewing the training session. We gained an understanding of how the lessons are taught and how the exercises, tests, and workbooks fit together. We also learned why the lessons are taught the way they are, and what the authors mean when they say they are teaching the concepts and the "why" behind algebra, instead of just memorizing the tricks. Adam then began Module A. The first few lessons were things we'd never seen before and even the older kids pointed out that they didn't know this stuff. I have to admit the first few lessons could have been written in a foreign language. Initially we were overwhelmed and not sure what we'd gotten ourselves into. However, the fact that the first few lessons were very different than what students had learned previously had been brought up in the training video so we kept at it until we reached more familiar ground, around lesson 5. The approach of the lessons is new to Adam and to me. For example, through this curriculum Adam has learned the how and why of changing fractions to decimal form with repeating decimal numbers. Not only did he learn the steps but he learned, through examples, how the steps made sense and worked. Also, instead of just stating that to divide fractions you simply multiply by the reciprocal the lesson on that topic thoroughly and clearly explained WHY that happens and why it works. Adam has had a tough time with a few of the lessons and has had to repeat them because he just wasn't grasping the concepts. I think that may be because of his age and grade level. This is his first introduction to Algebra and a lot of the material is new to him. To be honest, at times, even after the first four lessons, I wasn't sure this program would work for him. We kept at it though and have found our groove. After plenty of trial and error we've developed a system that seems to be working well. Adam watches the video (about 8-10 minutes long), we then go over the lesson in the Student WorkText together. After going over the lesson we work together on the odd exercises. If, after the first few questions, he seems to have the hang of it I back away and let him finish the odds and I'll grade those, if all is well he's ready to move on. If it's not coming to him we complete the odds together, then he'll do the evens on his own and I'll check those before we move on. The combination of working together and working independently seems to be just the ticket - he's now getting 90-95% of the answers correct (go Adam!) and the mistakes he does make are basic and not related to the concepts. There are two quizzes for each lesson (or set of lessons, there isn't always a quiz after each lesson), an A and a B. Adam will do the first one, if he does well we move on, if he struggles we go over it together and then he'll do the second one. We are still on Module A, out of six total modules, so I'm not in a position to say that this program does for algebra what peanut butter did for the sandwich, but, now that we're past the initial "getting going" struggles, I am pleased with the program and look forward to seeing how it progresses. Adam, the real judge of this one, wants to continue with it. He really likes the video and finds it much more interesting than a typical textbook. He appreciates learning the "why" of what he's doing and he likes that the lessons are shorter and not terribly repetitive. He feels he's learning much more than he was before and he appreciates having every single step explained. VideoText Interactive Algebra is available to purchase in a variety of ways. Individual modules can be bought for $99.95 each. Sets of three modules are available for $279.00. The complete six module set is specially priced at $529.00. Alternatively, the program is available as an online course for $299.00 for all six modules for up to two students. More detailed pricing information can be found here. The vendor recommends beginning the program in 8th or 9th grade, with flexibility for younger kids who are doing well in math and for older kids who are having some struggles.